There isn’t anything in football that carries the guarantee of generating polarizing views quite like a good NFL mock draft. Whether it’s from an NFL fan, college fan or positional ranking perspective, mock drafts tend to bring out the biggest opinions. Yet, they constantly change, and time and again, they aren’t right. 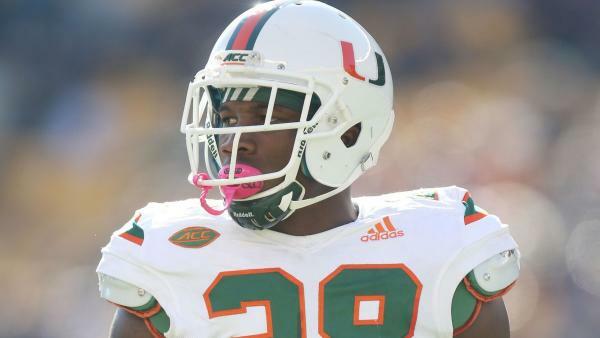 The latest great example of the first issue with mock drafts may be Miami cornerback Michael Jackson. The senior considered leaving school but decided to return after last season, and during the summer Bleacher Report had him targeted as a late first-round selection. That wasn’t a fluke. In early October, an NFL mock draft from CBS Sports also labeled Jackson as a late first-round pick. But with mock draft season beginning this week, Jackson hasn’t been listed anywhere on first-round mock drafts around the internet. Fans searching through in-depth second and third round mocks might not find him there either. At Walter Football, he is ranked the 36th-best cornerback available in the 2019 NFL Draft. That’s worth repeating -- 36th. Four months ago, Jackson was the 31st pick overall on a CBS Sports mock draft, and now he’s not even ranked in the top 30 at his position. Something obviously isn’t right. We’ll explain what could have happened, but regardless of the mock draft madness, Jackson has the skillset to make an NFL impact even if he is a Day 3 draft pick. This kind of drop off in draft stock is probably more common than even the big NFL fan realizes. The most obvious reason for a lower draft grade is a decline in play, but at least from a statistical perspective, that didn’t happen with Jackson. In the final eight games of 2018, Jackson averaged about 2.9 tackles, 0.3 tackles for loss and 0.3 sacks per week. During September, he posted approximately 3.8 tackles but 0.2 tackles for loss and no sacks per week. Furthermore, there’s no indication in any of his draft profiles that he experienced a drop off in his play during the 2018 season. More than likely, Bleacher Report and CBS Sports highly overrated him prior to the season and in October, respectively. Jackson was only in his first year starting for the Hurricanes in 2017, but there was talk about him entering the 2018 NFL Draft. In 2017, he totaled four interceptions with five passes broken up and 43 tackles. Jackson has good height and length for battling big NFL receivers. However, he faces some limitations. When he was considering entering the 2018 NFL Draft, some teams did reports on him, and one team source said they had him graded on Day 3. This is pure speculation on my part, but maybe Jackson really did want to leave school last year, then decided to return because NFL teams told him he would be a Day 3 selection. This report from Walter Football gels with that idea. In 2018, Jackson totaled 42 tackles with six passes broken up. Some have projected Jackson as an early-round pick, but in speaking to some team sources, they have graded him on the third day of the 2019 NFL Draft. While CBS Sports holds Jackson in a little higher regard than that, he’s still dropped considerably on their rankings. CBS Sports rates him as the No. 95 overall player in the class. With more than two months until the draft, Jackson’s stock could fluctuate more, but at this point, the consensus is he’s much closer to being a fourth-round pick than first. However, that doesn’t change the fact Jackson has the tools to contribute if he finds the right fit. The general consensus is the best fit for Jackson would be a press-man coverage scheme because of his 6-foot-1, 207-pound frame, but Matt Miller of Bleacher Report called him versatile and claimed he could move to free safety. Miller also wrote NFL teams could utilize his size as a nickel corner, where his speed wouldn’t be exposed. Yes, Miller insinuated Jackson’s biggest weakness was his speed. Other outlets aren’t calling him fast, but they didn’t necessarily declare his speed his biggest question mark either. Confused yet? Welcome to draft season. The skinny on Jackson is all over the map, but one thing is for certain -- he’ll be selected at some point and receive his chance to make an impact in the NFL.